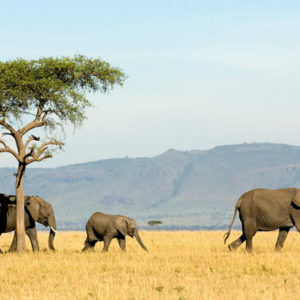 From the breathtakingly beautiful setting of the Ngorongoro crater to the Serengeti, famed for its annual migration when some six million hooves pound the open plains, this adventure visits the famous Giraffe Manor before ending with four days in the Seychelles where lush palms and tropical forests bloom and glorious white beaches abound. Ngorongoro crater – Ngorongoro crater, the world’s largest intact volcanic caldera is home to some of the highest density of big game in Africa. 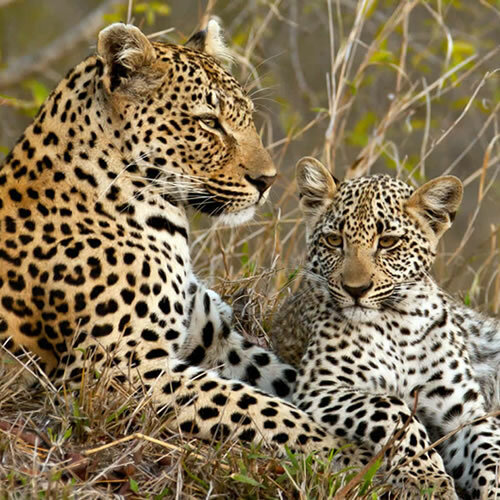 Serengeti – The exquisite savannah land which makes up the Serengeti has become globally recognised as one of the world’s most breathtaking regions in which to view Africa’s wildlife. Giraffe Manor – Home to a resident herd of endangered Rothschild giraffes, Giraffe Manor offers a unique safari experience in Kenya’s capital of Nairobi. Seychelles – A holiday in the Seychelles is synonymous with relaxed island life, romantic honeymoons, crystal clear seas and sparkling beaches. Upon your arrival at Kilimanjaro International Airport you will be met by an Eye See Africa representative who will transfer you by road to Arusha Coffee Lodge.This attractive little town is situated beneath the towering peaks of Mount Meru and Kilimanjaro. 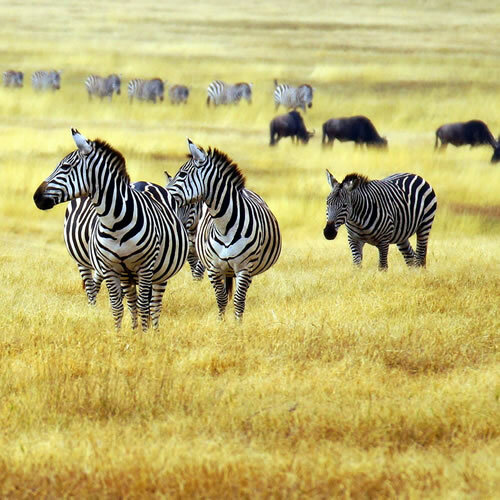 Arusha, renowned as the safari capital of Tanzania, offers a range of attractions and adventures. The town has numerous first-class restaurants, bars and markets to browse, and is the ideal place to spend your first night before embarking on a safari or attempting to scale Kilimanjaro. Not-to-be-missed is the Arusha National Park (in Ngurdoto Crater), the National Natural History Museum, the Laetoli Footprints (set in volcanic ash, dating back 3 500 000 years) and the beautiful coffee plantations which dot the landscape. The aptly named Arusha Coffee Lodge lies hidden amongst the sprawling grounds of Tanzania’s largest coffee plantation, set below the rugged peaks of Mt Meru. An idyllic retreat for before or after an African safari, this is an exceptionally stylish and comfortable lodge located close to Kilimanjaro International airport. After breakfast, you will be transferred to Arusha Airport in time for your scheduled flight to Manyara. On arrival you will be met by a representative from &Beyond Ngorongroro Crater Lodge for your short road transfer to the lodge.The Ngorongoro Crater in Northern Tanzania, once a gigantic volcano, is the largest intact caldera in the world. Some maintain that before it erupted, it would have been higher than Mt Kilimanjaro, the highest peak in Africa. 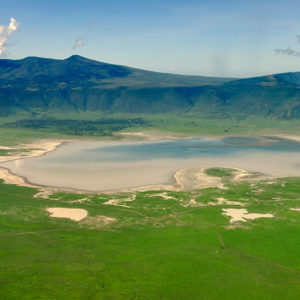 Today, long since having collapsed and eroded, it is an extensive highland area with the famous 600m deep Ngorongoro Crater as its focal point. Nearly three million years old the ancient caldera shelters one of the most beautiful wildlife havens on earth. Endangered black rhino are protected within its rim, giant tusked elephants wander the forests, black-maned lions stalk the grasslands, and flamingos crowd the soda lakes. An estimated 25 000 large mammals are resident in this bowl of plenty. Perched above cool, swirling mists on the edge of the Ngorongoro Crater, the sumptuous safari suites at &Beyond Ngorongoro Crater Lodge offer breath-taking views of the crater. Steeped in romance, each stilted, handcrafted banana thatch suite at &Beyond Ngorongoro Crater Lodge is adorned with graceful antiques and unforgettable opulence. En suite bathrooms, with a centre piece of fresh roses, feature huge showers and chandelier-lit bathtubs, while floor-to-ceiling windows ensure breathtaking views from all around. 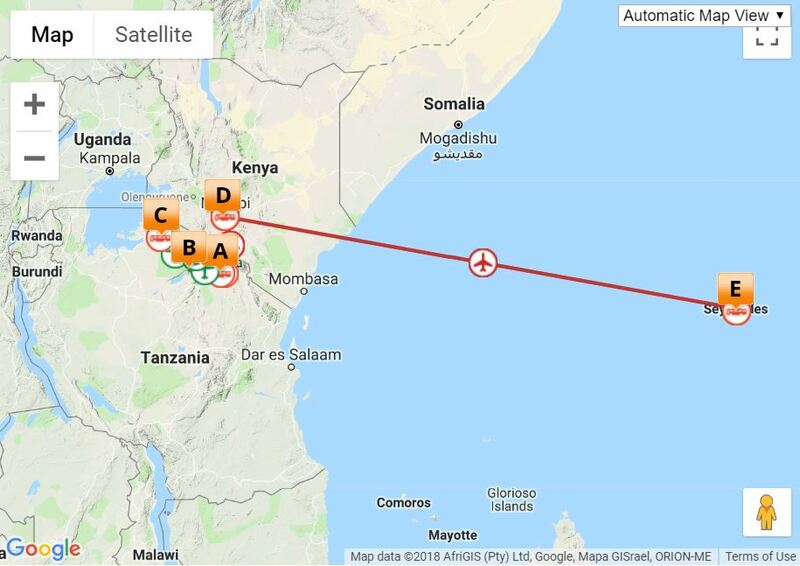 Depart by road to Manyara airstrip for your scheduled flight to Sasakwa Airstrip. On arrival you will be met by a representative from Sasakwa Lodge and be transferred to the lodge. 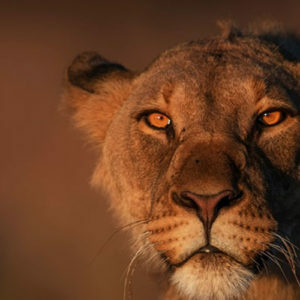 The Serengeti National Park, meaning endless plains in the Maasai language, is undoubtedly one of the world’s most celebrated wilderness areas and is an ongoing source of inspiration to writers, filmmakers and photographers. 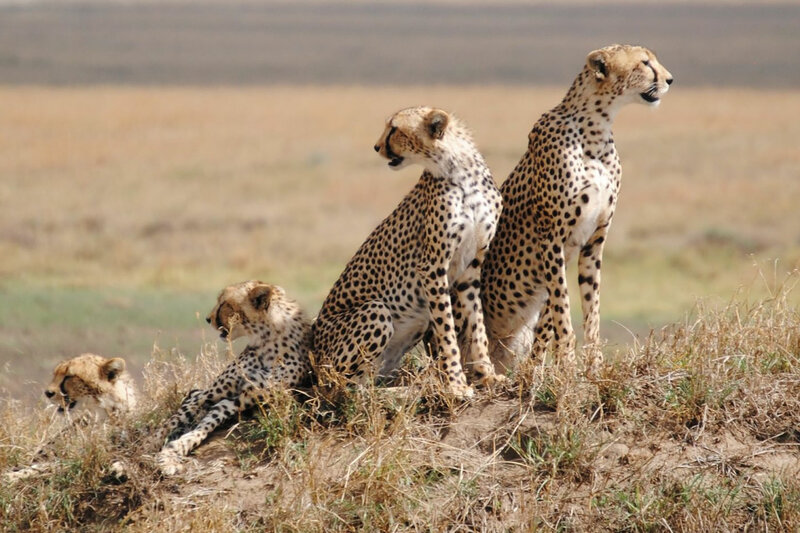 It is Tanzania’s oldest game reserve, renowned as the setting for the annual Great Migration, when an estimated three million antelope ,mostly wildebeest, migrate to Kenya’s Masai Mara Game Reserve. This epic, seasonal journey is a deeply moving experience and a wonderful photographic opportunity. Visitors to the park can roam its sprawling plains on exhilarating game drives or hop into a hot air balloon for a once-in-a-lifetime wilderness adventure. 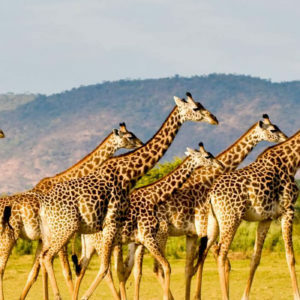 Depart from Singita Sasakwa Airstrip to Kilimanjaro International Airport for your connection flight to Nairobi where a representative will meet you for your transfer to the famous Giraffe Manor. Giraffe Manor is an exclusive boutique hotel, set in 12 acres of private land within 140 acres of indigenous forest in the Langata suburb of Nairobi. 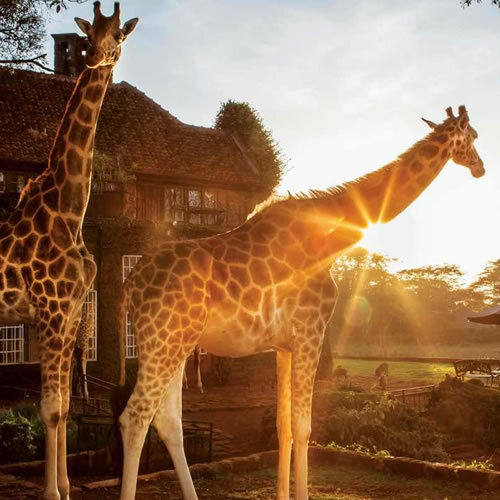 As one of Nairobi’s most iconic buildings, Giraffe Manor has extraordinary appeal, that harks back to the 1930s when European visitors first flocked to East Africa to enjoy safaris. With its stately facade, elegant interior, verdant green gardens, sunny terraces and delightful courtyards, guests often remark that it’s like walking into the film Out of Africa and indeed, one of its six suites is named after the author Karen Blixen. 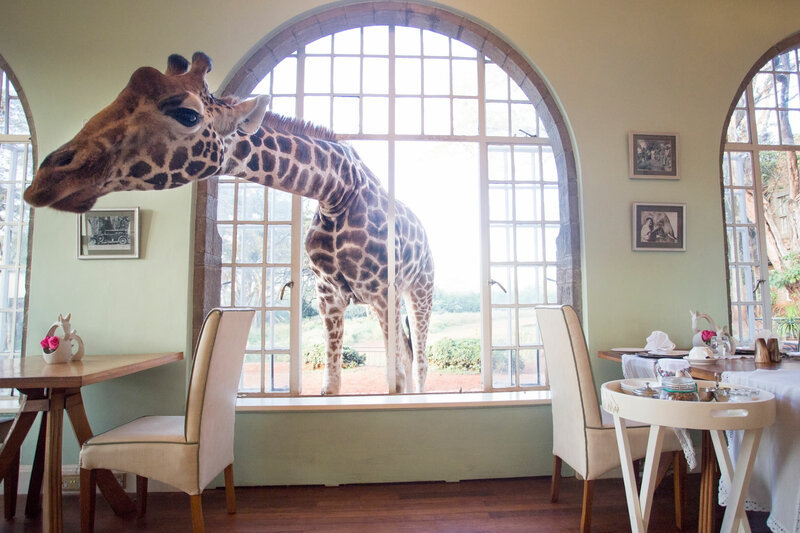 However, the most fascinating thing about Giraffe Manor is its herd of resident Rothschild giraffe who visit morning and evening, poking their long necks into the windows in the hope of a treat, before retreating to their forest sanctuary. Situated within 140 acres of indigenous forest and playing host to resident herd of Rothschild’s giraffe, The Giraffe Manor offers an experience incomparable to any other. 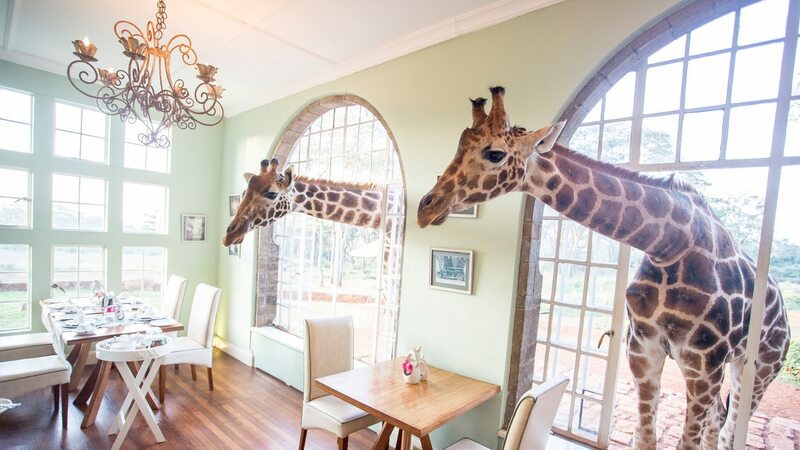 The building dates back to the 1930s and is modelled on a Scottish hunting lodge, creating a charming, yet luxurious place where animal lovers will enjoy every moment of interacting with giraffe and exploring the forest. After breakfast depart to Jomo Kenyatta International Airport in Nairobi for your flight to Seychelles. Upon arrival you will be met by a representative and transferred to Banyan Tree Resort. The Seychelles is an archipelago of 115 islands in the Indian Ocean off East Africa, known for its beaches, coral reefs, diving, nature reserves and rare wildlife such as giant Aldabra tortoises. Mahe island, with an international airport, is a key transport hub, home to capital Victoria, the mountain rainforests of Morne Seychellois National Park and white-sand beaches including Beau Vallon and Anse Takamaka. Be charmed into this exquisite slice of coastal life, where lush palms and tropical forests bloom and glorious beach abound. With spectacular views of the Indian Ocean and native Takamaka trees, Banyan Tree Seychelles luxury resort is nestled in Intendance Bay, a destination marked for bliss. Take a walk along the beguiling Intendance Bay or soak up archipelago charm within your Creole-style villa. After breakfast, you will be transferred to the airport for your flight to Yomo Kanyatta International Airport and then onward home bound. Banyan Tree Seychelles is set upon the original Seychellian abode belonging to Pink Panther actor Peter Sellers and Beatles member George Harrison. The luxury resort in Seychelles took painstaking steps toward preserving the authenticity of the site’s architecture and culture with the aid of island residents, some of who still dedicate their careers to forwarding Banyan Tree Seychelles’ mission of providing a Sanctuary for the Senses.